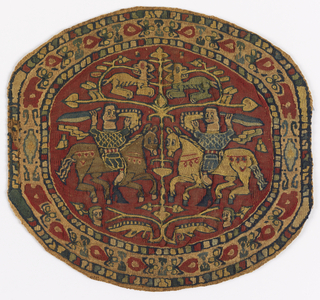 See more objects with the tag horses, royalty, lions, men's clothing, roundel, burial, riders. See more objects with the color saddlebrown peru tan darkslategrey darkslategrey or see all the colors for this object. This is a Roundel. We acquired it in 1902. Its medium is warp: undyed s-spun wool; wefts: s-spun red wool; s-spun white linen; s-spun pink wool; s-spun green wool (2 shades); s-spun black wool and its technique is plain weave with discontinuous wefts (slit tapestry), with supplementary weft wrapping. It is a part of the Textiles department. Egyptians in the Byzantine (fourth-seventh century C.E.) 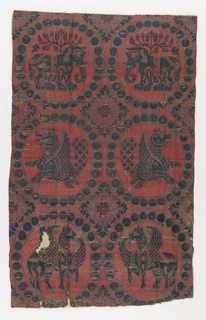 and early Islamic (seventh-tenth century C.E.) periods often decorated garments with woven designs. Most common among these designs were orbiculi (roundels on the shoulders and abdomen), segmenta (ornamental squares in the same places) and clavi (vertical stripes running from the inner shoulder past the breasts). 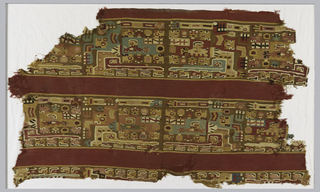 This example of an orbiculum likely decorated a tunic. 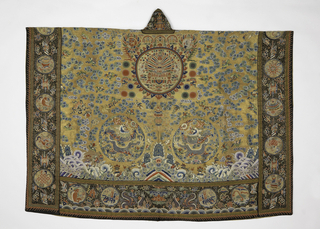 Since tunics were mostly pain linen and frequently damaged, it was common for 19th and early 20th century collectors and dealers to cut out decorative elements and sell or display them separately. This seems to have been the case with this example, which is almost identical to clavus 1902-1-22 in material, weave, and style. 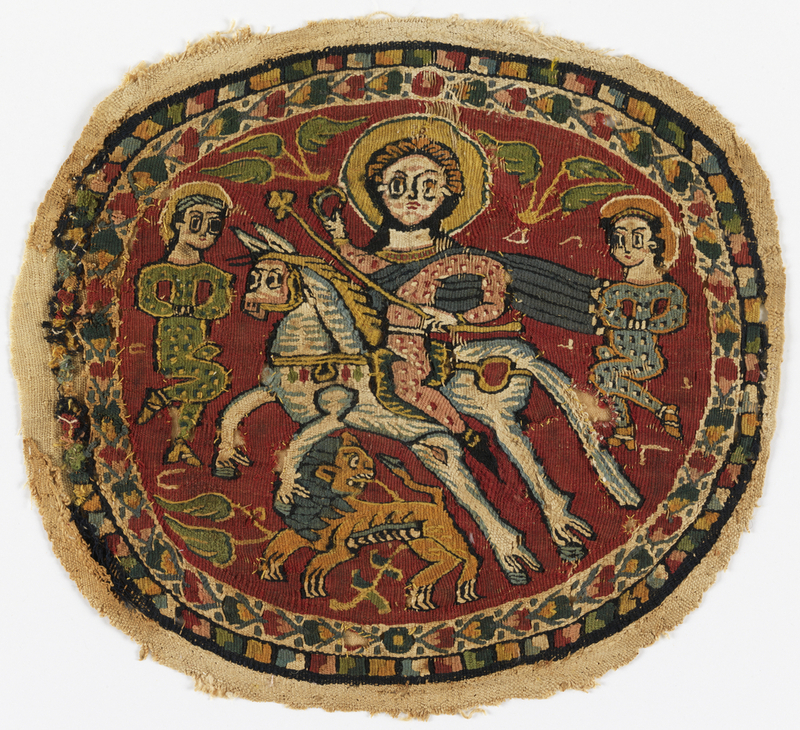 Hunter iconography was popular in Byzantine and early Islamic Egypt, particularly for funerary use. The inscription on this orbiculum is illegible, but the inscription on the matching clavus reads, “Long Live,” emphasizing the wearer’s triumph over death. 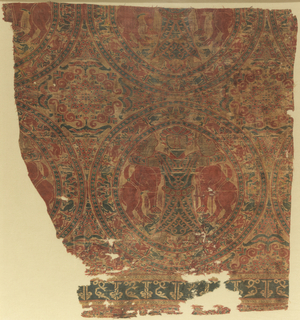 This object was featured in our Object of the Day series in a post titled Long Live. This object was donated by John Pierpont Morgan.